The beautiful two dimensional color wheel is published with its legend on the Information is beautiful website. 84 meanings are cross-culturally compared (Wester/American, Japanese, Hindu, Native American, Chinese, Asian, Eastern European, Muslim, African, South American). 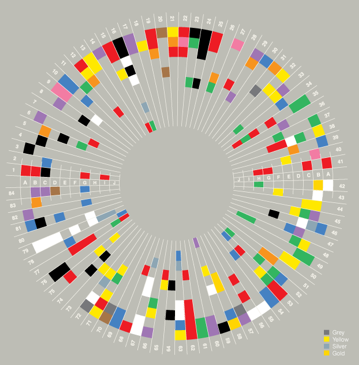 Meanings range from happiness to success, to jealousy, money and self-cultivation, and their color association have been harvested from several specific sources on the web, and with the help of John Gage’s research on color, art and anthropology. Who is the author of this book of tweets? Hi – I was wondering if there are any references/studies for the colour associations depicted in the figure? Hello Laura! It looks like they did conduct a study, but I’ve not seen it. If you click on the link, you will get to their website. Perhaps if you get in touch with them directly, they might send you the study.